The 18 Double Lane Slide is a perfect ride for large crowds and competitive spirits looking to race up and down the slide. 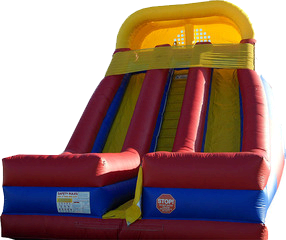 At 18 feet tall with an 11 foot tall slide platform angled at 40 degrees, this inflatable slide doubles the fun for all riders. Like all inflatables, the 18 Double Lane Slide is a fun way to enjoy physical activity with an additional competitive edge.